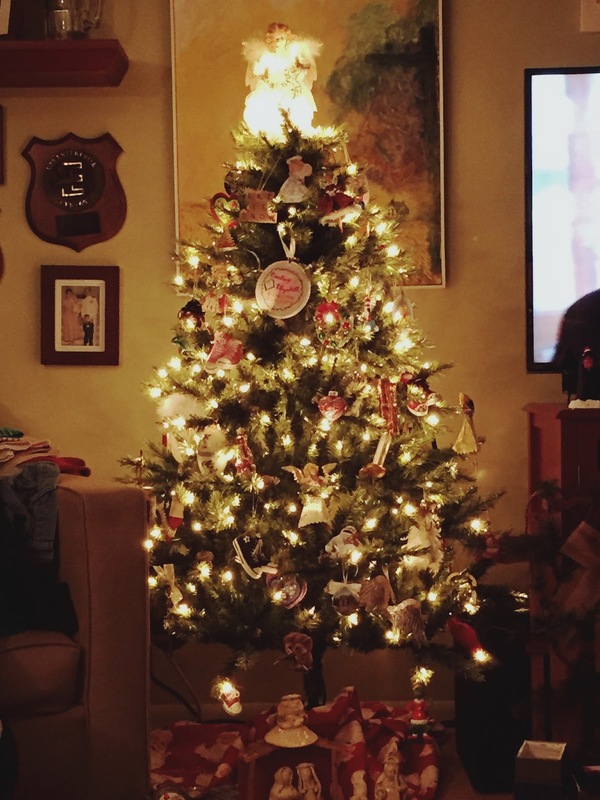 I wanted to jump in for a minute and share a little photo of Courtney’s tree. A few weeks ago I climbed up into the attic and got down the tree and decorations. I was actually looking forward to putting it up. It was such a happy part of Courtney’s world this time of year. She loved those lights so much. They made her smile every single day. As I began to unpack the ornaments, the guys began to tell stories about each one. Before I knew it, they were both in tears and having a hard time. Not really knowing how to proceed, I decided to pack the ornaments back up and back to the attic they went. Jerry, Jonathan and I sat down and talked our way through ALL the feelings. We agreed that it would be too hard for them to have the big tree up this year. Over the next few hours I prayed for inspiration and finally I came up with Plan B. Thank you Courtney and the Holy Spirit for the inspiration. Jonathan and I found a much smaller tree at a local store (we always have fake trees since both of them are allergic to pine). It’s pre-lit with white lights. Our other tree has multi-colored lights. It’s considerably smaller and has different lights. Something different. As Jerry said it was “just enough holiday”. The ornaments were all sent to us over the past year to commemorate Courtney’s life. I love every single one. Each one has it’s own story and it’s so wonderful. SO MUCH LOVE for our daughter and our family. I have learned that the grieving process is so different for every family. I had no idea the ornaments and tree would affect my guys the way it did. Totally did not see it coming. I am grateful for a Plan B. Life these days seems to be all about Plan B.
I lean into the grief when it comes so I am able to get through it to the other side. I give just as mush energy to finding the joy in each day and celebrating the legacy of love that our daughter left behind. On Sunday we will mark the first anniversary of Courtney’s death. The 9 am Mass at our parish, St Mary of Sorrows in Fairfax, VA, will be offered for our girl. If you are local and able, you are welcome to join us. To be together in prayer and community on that day is all we wish. We will go to her grave after Mass to lay flowers. Courtney may be gone from this world but her light and love never leaves our home or our hearts. We are so blessed to have loved her and to have been loved by her. It's absolutely perfect! I live all the white lights. It's so shiny and bright!! I'm so glad you have a tree of some kind this year, even if it's not "Courtney's". I imagine she's looking down with healed eyes and loving that people have filled your home with something so wonderful all to help you through this time. Such a beautiful, festive tree! It's a perfect way to honor and remember your Courtney. I wished I lived closer. I'd be there praying with your community. But, I'll pray for you across the miles instead. A beautiful tree to honor your beautiful girl. Courtney's tree is beautiful! I hope it's bringing you some joy, but mostly peace. I will still be in PA on Sunday, but I'll be at Court's Mass in spirit! I am so thankful that you are doing what is best for your family, instead of trying to force things. The tree is beautiful.